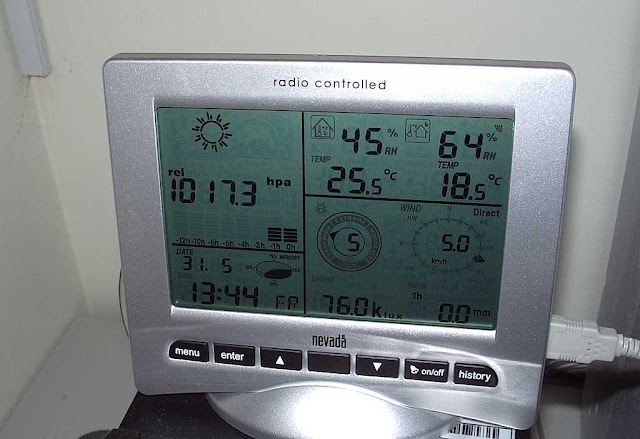 I hope I don't jinx it by writing this, but I think my weather station is now working. Everything is showing the values expected, including the rain which shows 0 mm as we haven't had any. Trust the Cumbrian weather to not rain when you want it to. It was actually Olga who got everything working. I had lost patience with it and was all for sending it back. Olga patiently went through the manual (which she found was poorly written) and double-checked everything. She even used my test meter to check the voltage of the newly installed batteries. She found that the rechargeable alkaline batteries supplied for the sensor/transmitter unit were only giving 1.3V each. So she took them out and replaced them with some new Energizer alkaline cells. And everything including the rain sensor started working! The manual says "Insert 2xAA 1.5V rechargeable batteries into the battery compartment of the remote sensor and immediately afterwards 3xAA alkaline batteries in the base station." It didn't say anything about charging them first. If I had provided my own rechargeable batteries I would obviously have charged them first. But as they came shrinkwrapped in the box I assumed they were ready to use. False assumption! It was as simple as that!